Now open at LEA 4 is Seasons of Life by John (Johannes1977 Resident), a Second Life photographer who has been rightfully gaining a respected reputation in-world for his photographic studies, which straddle the virtual and the physical worlds. As a serving member of the US Marines, for example, he shot a series of photographs showing military life whilst on deployment to Afghanistan, and these were recently featured in an exhibition at The Rose Gallery, Angel Manor. Seasons Of Life is focused squarely on John’s work as an in-world artist, and is his first exhibition at the LEA. In his words, it represents “a person’s life cycle combined with the scientific seasons of the Earth”. It sees the region, which is largely flooded at ground level, divided into five areas. Four of these are devoted to the four seasons – Winter, Spring Summer and Autumn, each presided over by portraits of its Guardian, as modelled by Draakje Dailey (Spring), Eleseren Brianna (Summer), Emma Portilo (Winter) and Issy Flatley (Autumn). The fifth area is given over to the Guardian of the Night, modelled by Seashell Dench. For example, the Winter Guardian is presented in two monochrome / grey-scale images, providing a subtle emphasis of the cold grip winters holds. However, where one has a bold, charcoal-like thrust to it, the other offers a more gentle, light-handed pencil feel to it. Thus they contrast with one another while at the same time complementing the scene they present – the stark boldness of the darker image emphasising the Guardian’s power as she towers over the landscape, arms raised and outstretched as if in invocation. Similarly, Autumn uses a more painting-like finish to each of the images (both watercolour and oil), allowing colours to be over-emphasised, echoing the rich natural hues of nature at that time of the year. Clever use is also made of animated gifs in places which again adds depth to the images concerned. The Guardians seem to shimmer into existence as you cam onto the portraits, for example, while in an Autumn images, the waters are the Guardian’s feet ripples gently. The animations can take a number of seconds to fully work given the rain, show and lightning effects in the installation, but the end result is certainly eye-catching. All told, an intriguing installation which will be open through until the end of October, I believe – but do take care when walking around. Step off the walkways, and you might find the water a tad bit deeper in some places than in others 🙂 . Dawn, the NASA / ESA joint mission to explore two of the solar system’s three “protoplanets” located in the asteroid belt between the orbits of Mars and Jupiter, continues to intrigue scientists as it studies Ceres, the second of its primary targets. As I reported in June 2015, Dawn is part of a broader effort to better understand the origins of the solar system and how the planets actually formed; all of which might give us greater understanding of how life arose here on Earth. 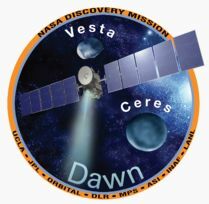 Launched in September 2007, Dawn arrived at Ceres in March 2015, after a 2.5 year transit flight from Vesta, its first destination, which it had been studying for 14 months following its arrival in July 2011. Because of their relative size – Ceres accounts for around one-third of the total mass of the asteroid belt – both of these airless, rocky bodies are regarded as dwarf planets, rather than “simple” asteroids. However, Ceres is proving to be quite the conundrum. 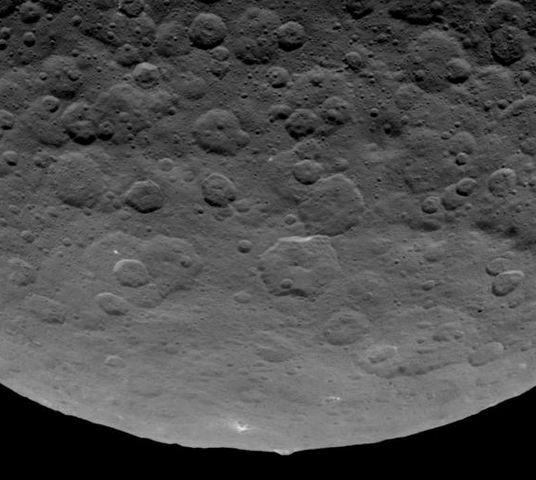 At the start of July, Dawn completed the first part of its high-altitude survey of Ceres and fired its low-thrust ion drive to start a series of gentle manoeuvres to reduce its orbit around from 4,400 kilometres (2,700 miles) to 1,450 kilometres (900 miles). It’s now hoped that from this lower orbit, the space craft will be able to discover more about some of Ceres’ more mysterious features. One in particular has been the subject of much debate. It started when Dawn imaged a series of bright spots within the crater Occator as it made its initial loop around Ceres to enter orbit. Since that time, it has repeatedly images the bright spots, and their presence has also been confirmed by the Hubble Space Telescope. Currently, it is believed the bright marks might either be salt deposits or water ice (the European Herschel Space Observatory had previously found evidence of water vapour on Ceres). However, while the science team aren’t leaning either way, their mission briefing on July 21st, leant some weight to the bright spots perhaps being water ice. This came in the form of an announcement that he 92 kilometre (57 mile) wide Occator has its own, very localised atmosphere focused around the bright areas. The evidence for this comes from images of the crater taken from certain angles which reveal a thin haze covering around half of the cater, but not extending beyond its walls. Th thinking is that this haze is perhaps the result of the ice in the bright area – if they are ice – sublimating out. However, if this is the case, it actually raises a further mystery: why the haze? Generally, such sublimation would lead to the resulting gases dissipating very quickly, without forming a haze. One hypothesis is that Ceres’ gravity, which is somewhat higher than might be expected for a body of its size) may be and influencing factor. 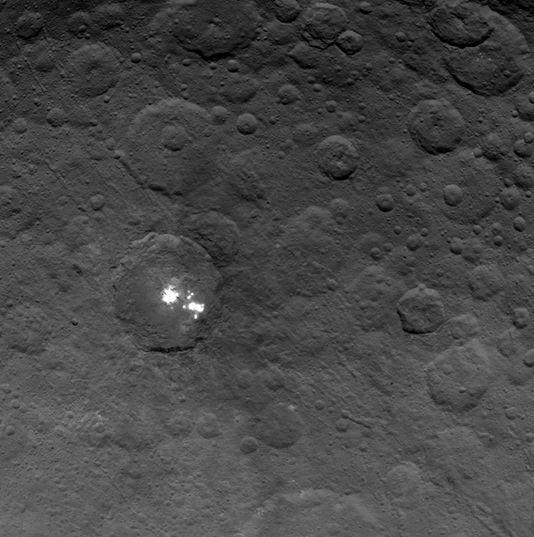 The 5 km high “pyramid” mountain pokes up above the limb of Ceres. Flat-topped, it has streaks of bright material on its flanks giving the impression something has been flowing down it. The bright spots aren’t the only curious feature on Ceres. Dawn has also spotted numerous long, linear features whose cause is unknown, as well as one big mountain that mission team members have dubbed “The Pyramid.” This massif, about 5 km (3 mi) in height, and around 30 km (19 mi) across at its base, is oddly flat-topped and has streaks of bright material on one of it flanks, as if something has been cascading down the slope. What this might indicate has planetary scientists scratching their heads at this point. With all the mysteries thrown up by New Horizon’s recently flyby of Pluto, and Dawn’s discovery of mysterious features on Ceres, it really is becoming a case that the tiny worlds of our solar system are perhaps the most perplexing. Three years ago, in August 2012, NASA’s Mars Science Laboratory rover, Curiosity, arrived in Gale Crater, Mars. Since that time, the rover has made some remarkable discoveries, as reported in this blog over the years. To mark the anniversary of the landing, NASA has launched two new on-line tools designed to open the mysterious terrain of the Red Planet to anyone with an interest in planetary exploration. Experience Curiosity allows users to journey along with the one-tonne rover on its Martian expeditions. The program simulates Mars in 3-D, using actual data returned by the rover and NASA’s Mars Reconnaissance Orbiter (MRO). It also uses a game-ready rover model based entirely on real mechanisms. User are able to drive the rover, examine it, call up data on key components, witness the driving view from different cameras on the rover, and operated the robot arm. Activities are a little basic, but as this appears to be a part of NASA’s Eyes On project, capabilities may grow over time. Mars Trek is a much more expansive tool – one which is actually being used in the planning for the Mars 2020 rover mission. It features interactive maps, which include the ability to overlay a range of data sets generated from instruments aboard spacecraft orbiting Mars, and analysis tools for measuring surface features. 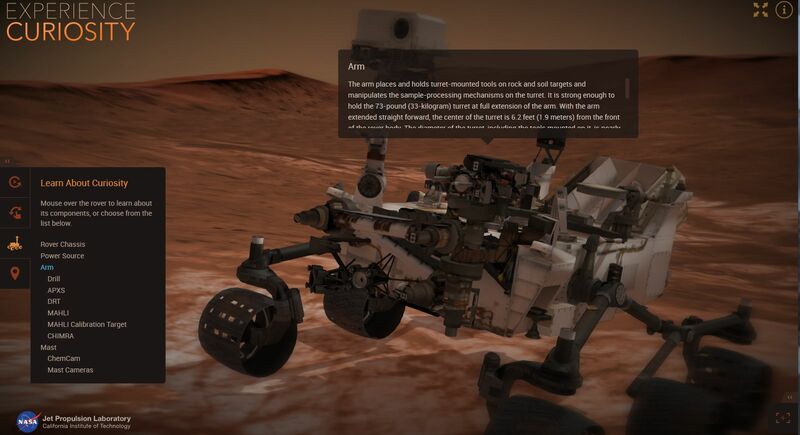 Standard keyboard gaming controls are used to manoeuvre the user across Mars’ surface, and topographic data can be exported to 3D printers to allow the printing of physical models of surface features. The map view and be manipulated in 2D or 3D, data on various surface missions is provided, compete with the ability to zoom into the surface locations for these missions, making for a visually impressive model. And the truth is – it really is – and so much more. This is a region of scenic contrasts, from low-lying, meadows edged with water, to high rocky plateaus from which waterfalls cascade, this is a place demanding gentle exploration, by either following the footpaths leading away from the landing point, or by wandering where soever your feet wish to take you. This is a place rich in natural colours, the trees and flowers suggestive of a long afternoon stretching its way lazily from spring to early autumn, and where surprises await around every corner. Romantics are catered for, with plenty of cuddle spots scattered around, some on the ground, others hanging from sturdy tree branches and others floating on the waters or under the tiled roofs of gazebos. often with Intan dance systems nearby. Photographers are also catered for; there is much here to attract eye and snapshot floater, and under a wide selection of windlights, depending upon your location and where you’re looking. The paths, trees and fields offer lots of rural opportunities for pictures, while the wreck of an ancient man o’ war (or is it perhaps a pirate ship? Ah, let your imagine decide!) sitting off the coast, watched over from ruins on a high cliff offers plenty of opportunity for dramatic and mysterious shots. Meanwhile, the ruins offer a hint of fantasy in which to indulge, as does what appears to be an alchemist’s cottage sitting a short distance away. This is also a place of delightful whimsy, with lots of little touches scattered throughout which cannot fail to bring a smile to the face when discovered. Even the orient touches the region in one corner, adding to the eclectic nature of The Place. Not that everything is in any way a jumble. Such is the skill of the design, everything flows together naturally; so much so, that the overall effect of exploring Eclectia is one of journeying through neighbouring lands, rather than simply wandering a single region. In fact, with so much to discover, coupled with the opportunity to take photographs, as well as the myriad of places to sit and unwind as the music plays, it’s easy to get lost within Electica – as I did, for an entire afternoon! Maddy has done a superb job with what is her first region build. Electica has deservedly gained wide recognition across Second Life. With my own project beckoning me back, I hope that some of her creative eye has rubbed off on me, such is the captivating look and feel to the region. And if not, then I’ll just and to come back and sit under tree or on boat or couch and let the world take care of itself.